In an NCAA basketball tournament filled with upsets, only one person is known to have picked the first two rounds perfectly, an autistic 17-year-old from Chicago. My bracket is busted. 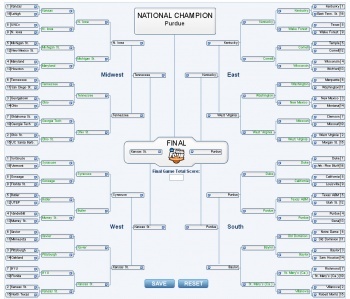 I picked Kansas, the overall favorite, to go deep, and Villanova to reach the Final Four. Sure, I picked a few sleepers to win and tried to guess a few upsets but nothing prepared me for Cornell. Seriously? An Ivy League team in the Sweet Sixteen? Who could have predicted that? One person could. Alex Hermann has correctly picked the winners of the first 48 games of the NCAA tournament through its first two rounds. The odds of accomplishing that feat is 1 in 13,460,000. There's more of a chance that you'll be struck by lightning, win the lottery or be killed by a dog. So how did Hermann, who happens to be autistic, do it? "I'm good at math," he said. "I'm kind of good at math and at stats I see on TV during the game." His brother, Andrew Hermann, is amazed. "I checked his bracket and it was off the chart," he said. "I thought it was a big deal." Stats and basketball analysis only goes so far. The on-air experts at ESPN and CBS couldn't have guessed the outcome of all those games correctly. Even crowdsourcing isn't perfect, as the leader of ESPN's Tournament Challenge game, of which 4.78 million have participated, has incorrectly predicted four games. Perhaps a little bit of an emotional connection helped Hermann. He picked Purdue to win its first two games, which isn't unheard of for a #4 seed, but he also picked them to win the whole tournament, which is less likely. Incidentally, Purdue is where Andrew Hermann went to college. "They're [Alex's] favorite for that reason," the boys' mother said. You can check out Hermann's bracket here. One wonders what would have happened if Hermann tried his hand at picking which game developer would win March Mayhem. So Alex, if you're reading, who do you think is going to win?